Theo Jansen's Strandbeests are truly amazing kinetic sculptures that harness the wind to move - and now you can have one of your very own! Jansen, in collaboration with on demand 3D printer Shapeways, has two models available for purchase. No assembly is required, and the fully articulated structural systems are ready to move as soon as they come out of the printer. You can also purchase a 3D-printed wind propulsion add-on that allows the mini-beests to move by themselves. Yours for only $100, the mini Strandbeests are a fantastic example of 3D printing and replicas of the wind-powered sculptures. Jansen’s Strandbeests are wondrous wind-powered automatons that exhibit almost life-like qualities and are capable of moving around on their own. Most are built from piping, wood and sail cloth and over the years, the designs have become more sophisticated to adapt better to the environment of the Dutch coast. Jansen keeps fine-tuning their design and adding new features to expand their capabilities. He even has dreams that one day the kinetic beasts will actually be able to reproduce. 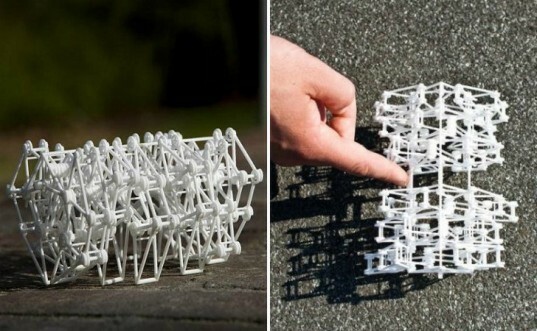 But until he can design a self-replicating sculpture, Jansen has created a miniature 3D printed version for home use. Two models are available on Shapeways – Animaris Geneticus Parvus #5 & #7 are fully functioning and moveable models based on Jansen’s work “the Rhinoceros”. #7 has pointy feet compared to the flat feet of #5 and each come fully functioning without any assembly. The mini beests do not move on their own however and they need to be pushed or pulled to get going. But, if you purchase the propeller propulsion add-on, you can harness the power of wind to get your little beestie moving. Both #5 and #7 are about $100 each and the propeller is an additional $40 – not cheap, but excellent gifts for people who love art, engineering and the wind. Jansen's Strandbeests wondrous wind-powered automatons that exhibit almost life-like qualities and are capable of moving around on their own. Most are built from piping, wood and sail cloth and over the years, the designs have become more sophisticated to adapt better to the environment of the Dutch coast. Jansen keeps fine-tuning their design and adding new features to expand their capabilities. He has dreams that one day the kinetic beasts will actually able to reproduce. 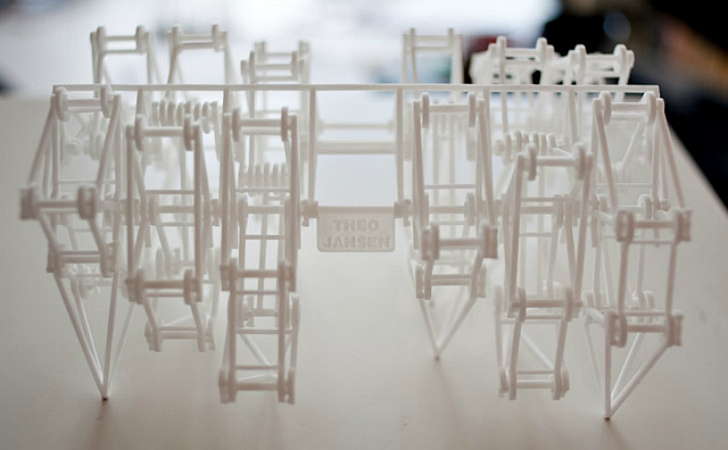 But until he can design a self-replicating sculpture, Jansen has created a miniature 3D printed version for home use. Two models are available on Shapeways - Animaris Geneticus Parvus #5 & #7 are fully functioning and moveable models based on Jansen's work "the Rhinoceros". The mini beests do not move on their own however and they need to be pushed or pulled to get going. But, if you purchase the propeller propulsion add-on, you can harness the power of wind to get your little beestie moving. Assembly of propeller add-on to mini strandbeest. #7 has pointy feet compared to the flat feet of #5 and each come fully functioning without any assembly. Both #5 and #7 are about $100 each and the propeller is an additional $40 - not cheap, but excellent gifts for people who love art, engineering and the wind. One of Theo Jansen's Strandbeest moving out on the beach.